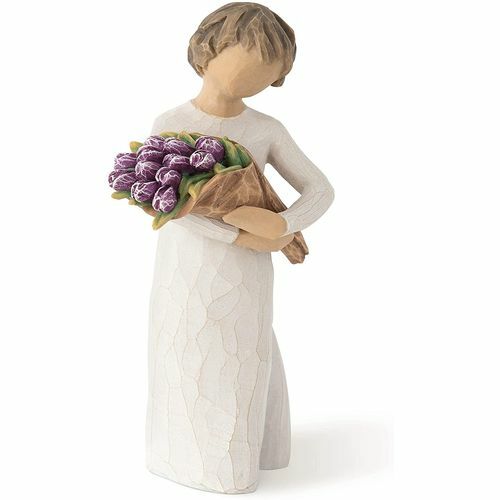 Message on the card inside reads: "A bouquet of beautiful wishes"
"When tulips bloom, theyre such a delightful surprise - a harbinger of spring of longer days,sunshine,outdoor activity, new beginnings and refreshing changes.This figure holding a bouquet of purple tulips could be given to a friend as a congrats gift, a get-well gift, a symbol of hopefulness and renewal. Perhaps given to someone making life transitions, and moving on to something new. A bouquet of tulips can also be the little surprise gift that lifts ones spirits for no reason at all." - Susan Lordi.